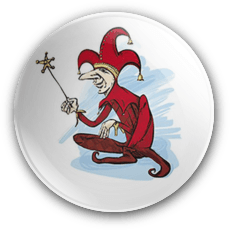 The steep playthough requirement of 30 times the deposit and bonus sum (60xb) attached to the sign on bonuses merits our court jester badge. The badge will only be removed once management agrees to lower the playthough. EuroKing Casino is licensed in Curacao, Netherlands Antilles. The operator has been online since 2008 and owned by Interactive Marketing Solutions N.V.
From a gaming perspective it certainly looks the part since it’s powered by Net Entertainment, SkillOnNet,WMS, Nextgen, xpro live, Evolution Gaming and Amaya. EuroKing offers holistic game play since it includes a live casino, 3D slots machines, table games, video poker, specialty games and towering jackpots. The software client of the casino is available in the instant play or download. I suggest that you go for the downloadable version since it offers an extended game library. I’d like to point out that the SkillOnNet software has been guilty of malfeasance in the past. I know it’s not the operator’s fault but the mere fact that it signed on this software compelled us to deduct a point for credibility. Please understand that we are not out to tarnish the operator’s image but to simply state the facts. ThePogg.com wrote an article about the discrepency of SoN (SkillOnNet) software, you can read more about it on this page. If you want to extend your playing time at the casino and you’re a first time customer, EuroKing Casino offers you a 300% match bonus package up to $1,800 spread over three deposits. The first bonus is 300% up to $600. I must admit that it’s a lucrative bonus offer. But, it’s the playthrough attached to it that’s got me scratching my head once again. Before you can withdraw any winnings associated with the bonus you must roll over the deposit and bonus sum 30 times (60xb). To qualify for it you must deposit at least 20 credits and provide the following bonus code: KING1. Games that contribute 100% towards the completion of the play-through are all slots and scratch card games. Due to the steep WR (wagering requirements) attached to the bonus I won’t recommend the bonus until the roll over amount attached to it has been lowered. As such it also merits our court jester badge. If management agrees to lower the play-through we’ll remove the badge and add our quality badge to the casino. Many players still don’t understand how the bonus wagering is calculated. For the sake of clarity here’s a brief explanation: David accepts the bonus and deposits $100. Since it’s a 300% match bonus he’ll receive an extra $300, his bankroll just shot up to $400. But, before he can cash out his winnings associated with the bonus he must turn over 60x$300=$18,000. From the calculation it’s pretty evident it’s hard to plow through. EuroKing Casino can be contacted 24/7 through email, telephone or live chat. If you use email to contact it, expect a reply within 6 hours maybe sooner. The most convenient way to contact the casino is through live chat. You can also call the support staff through the number listed on the site. Keep in mind that normal international rates apply which might be costly. To test the site’s customer support I enquired about their bonus offers, I received a reply to my query within 3 hours-not bad at all. A comprehensive FAQ section covers questions on how to open an account, is it safe to gamble over the Internet, system requirements and so forth. The usual tools like deposit/session limits as well as a self-exclusion are available to problems gamblers and to players who have one eye on their bankrolls. If you feel like you need a cooling-off period from the operator simply shoot the casino manager an email. Before you self-exclude yourself, withdraw all the funds from your account first otherwise you won’t be able to withdraw it until the self-exclusion period expired. Although EuroKing Casino offers a mixed bag of games by different vendors it does not list the average payout ratio for each game on its website. The operator states that its software is audited by iTech Labs yet it does not list the findings of the audit report on its website. From a player’s perspective this is important since it indicates that the operator is transparent and that it’s casino games are secure. All your personal information such as billing address, shipping and account information is stored on highly encrypted servers based in Alderney and Gibraltar. In summary. As a rule of thumb I can’t fault EuroKing Casino per se, so far the operator has been above board. The only caveat I have is the SkillOnNet software which rigged its video poker games. The bonuses on the other hand although lucrative are bogged down by excessive bonus terms and steep play-through. If you accept a bonus make sure you understand its terms. Otherwise recommended. EuroKing Casino offers an ocean of promotions and caters virtually to every player’s palate. It offers a monthly reload bonus to loyal players. Plus a tiered VIP program that handsomely rewards its high rollers with all kinds of goodies ranging from cash prizes, special bonuses to faster withdrawals. If you accept a bonus make sure you’re familiar with its terms and don’t forget to provide the bonus code. The operator also offers a 10% cashback once you’ve wagered $1,000 on any game. It’s refreshing to see an operator that lists a vatiety of deposit and withdrawal methods. The minimum amount the casino needs before you can start playing is 20 credits. Aside from American dollars, Euros and British pounds, EuroKing Casino accepts a host of other currencies like Australian dollars, Russian rubles, South African Rands, Canadian dollars, Swedish kronor, Swish francs and many more. The monthly withdrawal limit is $10,000. The good news is that large wins and progressive jackpot wins are paid out in one lumps sum. No bank fees are charged for credit cards and ewallets (Neteller and Skrill). The operator does charge a transaction fee of 10 Euros for wire transfers that are more than 500 Euros. Cheques: 14 to 28 days. With a game library of more than 200 games I’d be lying if I tell you that EuroKing hasn’t got you covered in this department. The majority of the games that can be played range from a medley of low to high-variance slots machines. It includes 3, 5 and 3D varieties. If you’re looking for games laced with high-end graphics and animations the NetEnt and NextGen slots is a good start. Games that have a huge following at the moment are Vampires Feast, Sweet Insanity, Dracula, Gonzo’s Quest, 300 shields and Hot Wheels. If you decide to take a break from the slots and want in on some table game action, baccarat, blackjack, pai gow poker, craps and roulette (American and European) variants will keep you entertained until the wee hours of the morning. One of my favourite games to play since it requires some skill and lessons the brunt of the house edge to a certain extent. It’s ideal for low rollers like myself. Popular games at this stage are Deuces Wild, Aces and Eights and Joker Poker. When playing video poker make sure that you hold the correct cards and don’t be hasty, take your time. If you’re looking to take your game play to the next level you can try out live baccarat, roulette or blackjack. The games are streamed directly to your computer via webcam from a live studio. The reasons why live games are so popular is because they’re interactive; you can chat to fellow players and the dealers if you please. It replicates the casino environment which is akin to that of a land-based casino.